When we visited the Grand Palais on Avenue Winston Churchill to see the 'ArtParis 07' fair, I was overwhelmed by the patterned ceiling – a geometrical orchestration of glass and metal in the art noveau style. 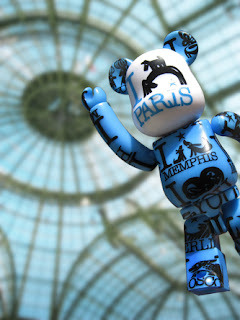 I quickly brought out my latest acquisition, the 'I Love Paris' Be@rbrick of the 'A Round World' series from Colette Paris, and took a picture of it against the delicate-looking but magnificent ceiling (left). (5) the I.M. 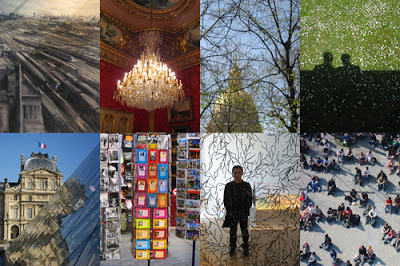 Pei-designed pyramid cutting across the Louvre facade; (6) colorful displays of postcards on a Parisian sidewalk; (7) a modern art installation at the Pompidou Centre; and (8) tourists sunning themselves practically everywhere! 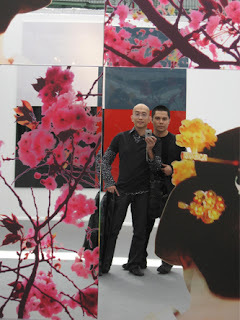 Postscript: That's me and my friend, Jun, (right) reflected on a 'mirror' painting of cherry blossom patterns, one of the artworks on sale at ArtParis 07. After visiting numerous art museums, stunning churches, grand chateaus, and baroque buildings... and after walking through countless parks, historic squares, breathtaking gardens, and quaint streets, Jun sat down on a bench and said to me, "Can we rest for fifteen minutes? I think I'm having a 'beauty' overload." Many years ago I was in London and one day I found myself standing at the train station contemplating on whether I should go and take the train to Paris. I was on a business trip but I had that one free weekend to do as I please. I should have taken that train!!!! Ariel, your pictures are always stunning! Enjoy the rest of your trip.